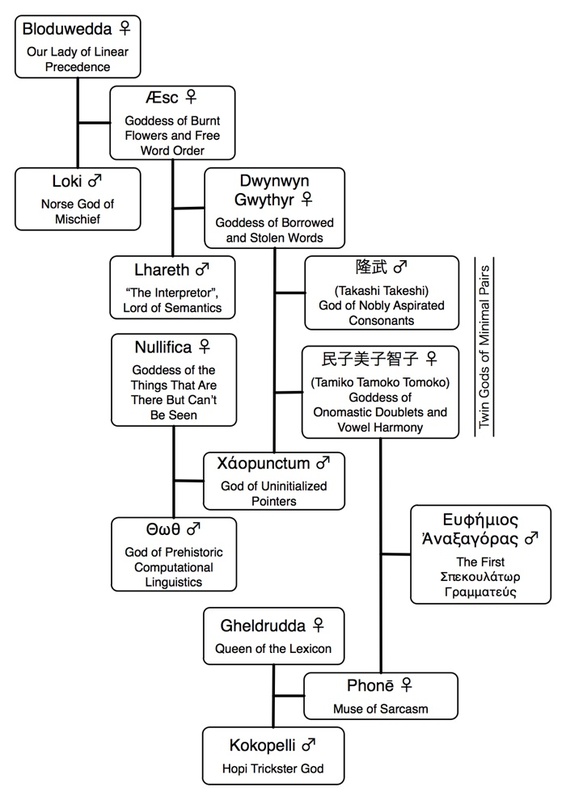 Linguists have always had several choices of deity—including Bloduwedda and her lot, or Θωθ, the pre-technological deity of computational linguistics—but there have never been any gods of satirical linguistics. However, on a recent data-diving expedition, we three junior SpecGram archivists have discovered that we are not as theologically lonely as we might have once thought. Detailing what has been described as “an orgiastic melting pot of world religions”,⁂ several 3rd-century Phoenician scrolls found in modern-day Lebanon in the 1830’s give the divine genealogy of the first Σπεκουλάτωρ Γραμματεύς.† Part of the story contained in these texts is presented below, translated and rendered into English by the AutoGrammatikon™ Quasi-Universal Translator and Optikal TransduserSM. As a service to our readers, we also provide the following family tree, for easy reference and study by the faithful. Now satirical linguists of all stripes can find some deity that appeals to them on a personal level, while retaining sound textual and theological links to one or the other of the provably true religions: Bloduweddaism and Anti-Bloduweddaism. The more sarcastic among us may invoke Phonē in times of need. Those who find sarcasm a low form of satire may profess Anti-Phonēism. Computational Lingua Pranckers will enjoy the anarchic blessing of Χάοpunctum in their code, while the Anti-Χάοpunctumites diligently initialize all variables. The SpecGram Puzzle Elves™ have already set up a shrine to 民子美子智子. Satirical linguists who wish to give in to their baser prescriptivist leanings may embrace Ευφήμιος Ἀναξαγόρας, already a saint among some members of the Original English Movement. There are even rumors—possibly only urban legends—of a Cult of Частица forming among the Αντι-Ευφήμιος-Ἀναξαγόρασιστας within the OEM. They are said to believe that Частица will rise again at the time of Runikarok—an end-times scenario in which the ᚠᚢᚦᚩᚱᚳ will re-assert dominance over a pan-global English, bringing the world to an end. At Runikarok, Частица is supposed to devour Ευφήμιος Ἀναξαγόρας. See, there’s something for everyone! ⁂ Butch McBastard, 2011, personal communication. † They also assume a familiarity with world mythology and Divine Unification Grammar. ◊ Cabalists’ Note: Māui (the Polynesian trickster god), Puck (the mischievous English nature sprite), and several well-known Leprechauns have all been identified in several ancillary scrolls as likely candidates to be the anonymous donor of the necessary, uhhh, “moving constituents” required to inseminate the female power couple. Also of note, each mother carried the baby for 4 or 5 months—they alternated every month so that the pregnancy and attendant discomforts would not unduly interfere with their careers outside the home.